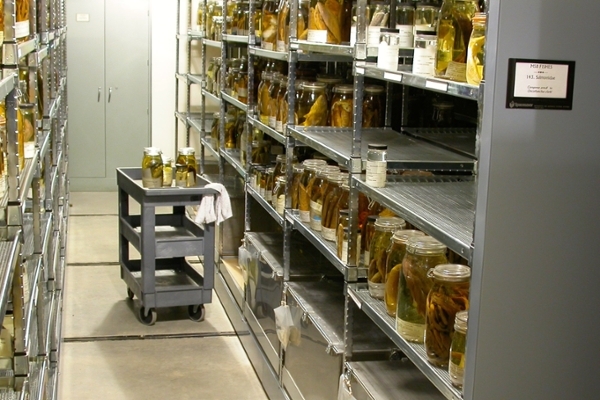 Specimens of fishes and related collections (photographs, field notes, and data sheets) are primarily received from agency field crews employed to monitor and study the fishes of New Mexico. We receive collections from the New Mexico Department of Game and Fish, U.S. Fish and Wildlife, U.S. Bureau of Reclamation and other federal and state agencies in Utah, Colorado, and Arizona. Ichthyology classes and graduate student research also contribute to the collections. Specimens and documents received are consistent with the mission, goals, and geographical profile of the Division. Copies of all relevant collecting permits must accompany the specimens. Original field notes with complete and pertinent locality data are deposited with the collections. Specimens are collected according to current guidelines found in American Fisheries Society (AFS), The American Institute of Fishery Research Biologists, and the American Society of Ichthyologists and Herpetologists (ASIH) Guidelines for the use of fishes in research. Basic criteria for other donations such as libraries, equipment, or funding can be found either with the UNM Foundation. The Division staff do not provide appraisals of specimen collections or documents but will provide the donor with a written acknowledgement (on museum letterhead) of receipt. The MSB Division of Fishes does not purchase collections of any kind. For further information call or email the Collections Manager. Accession Number and Files: All incoming collections receive a unique accession number and a hard file for storing collecting permits, correspondence, reports, photographs, and CD backups of electronic files that relate to the accession. Destructive Sampling: Removal of tissues and parts of specimens is not allowed in the W.J. Koster collections nor the collections of rare and extinct fishes. Any destructive sampling must take place on the RIGHT SIDE OF THE SPECIMEN, must not destroy bone, and cannot disrupt important diagnostic characters such as barbles, urogenital vent, or scales used in meristics. Specimen Processing: All specimens are sorted, identified, counted, and the standard lengths taken for the smallest and largest individuals. Specimens of adult fishes that will be placed in the ethanol collection are transferred from formalin to water, then through ethanol concentrations of 35% and 50% before they are permanently placed into 70% ethanol. Eggs and larvae are counted and the stage noted. Eggs are maintained in buffered 5% formalin. Larvae are maintained in either buffered 5% formalin or transferred through an ethanol series to 70%. ﻿Loans: Requests for specimen loans must be sent to the Curator of Fishes in a letter on institutional letterhead (loans are made to institutions) stating what specimens are required and for what purpose. Loans to student researchers are made to the students’ major professor who is responsible for the specimens’ condition and timely return. In the formal loan request, the researcher must specifically ask permission to dissect or remove parts from specimens. Specimen loans are sent via FedEx and an invoice with transaction details provided under separate cover (pdf attached to email). On the MSB invoice, discrepancies in counts or species received as well as any damage to the specimens must be noted. The invoice must be signed as acknowledgement that the specimens were received and that the researcher will adhere to the terms of the loan. The signed invoice can be returned in the mail or as an attachment to an email to the Collections Manager. Return of MSB fish loans are expected within a year after specimens were loaned. Packaging (double bagged specimens wrapped in cheesecloth, same number of boxes) and shipping (FedEx, UPS, or DHL) must be the same as when received. Before shipping MSB specimens, the Collections Manager must be notified and tracking numbers provided. Transfer of Specimen Tissues: Tissues or whole specimens sent to researchers for genetic study will bear the MSB catalogue number. An invoice under separate cover will be sent and must be signed as detailed in the loan transaction (see above). Researchers using MSB specimens and tissues for genetic analyses must submit the MSB catalogue numbers to GenBank. Two copies of the published results must be sent to the Division. Incoming Loans: These are normally solicited by personnel in the Division or researchers who are affiliated with the Division (UNM Department of Biology, New Mexico Dept. Game and Fish, U.S. Fish and Wildlife, and so forth). The MSB Division of Fishes takes full responsibility for the proper care and safe return of all specimen loans received by their staff and researchers affiliated with the Division. Gifts and Exchanges: These collections are received from other museums, research institutions, or scientific expeditions. The terms of the gift or exchange must meet with the approval of the Curator of Fishes. Examination of Original Documents: Most of the Division’s original documents are available for examination by viewing digital copies. Once permission is granted to view documents, the researcher must visit the Division during normal operating hours. The Collections Manager will retrieve and file all documents. Visitors: Visitors to the MSB fish collections are by appointment only. A letter or email requesting an appointment must be made to the Curator of Fishes. This letter must include purpose of visit, for how long, and the materials that will be requested during visit. Visitor support by the MSB Division of Fishes includes access to microscopes and work bench space. Specimens or other collections will be filed after they are used by collections staff. Published results utilizing MSB fish specimens, tissues, and documents must acknowledge the use of these collections and submit either an electronic or hard copy of the publication to the MSB Division of Fishes. Specimen and field data are currently captured, electronically, using MS Access 2007. This program supports cataloging, mapping and report generation. The management of the MSB fishes database serves two purposes: to organize specimen data efficiently and to effectively disseminate those data for legitimate, nonprofit research. Special requests for specimen data are available to qualified researchers for academic or educational purposes only. These requests must be sent to the Curator of Fishes in a letter on institutional letterhead. In the letter of request, the researcher must state what data are required and for what purpose. All data provided are considered provisional; that is, the researcher should treat species identities or localities as unverified and subject to corrections or change over time. Therefore, it is prudent for the researcher to verify those data before publication. The MSB Division of Fishes does not take responsibility for inaccurate results or reporting due to use of museum data. Data sharing or third party distribution of MSB fish data is not allowed. All researchers must seek permission of the Curator of Fishes prior to use of MSB fish data. MSB records of fishes can be searched using FishNet2. Publications using MSB fish data (received from Division or data portal) must acknowledge the MSB Division of Fishes as the source of data and submit copies (electronic or hard copies) of the publication to the MSB Division of Fishes.